Affisch med illustrationer av 13 ätliga tångsorter i Norden med svenska, norska, danska, engelska och latinska namn. Nordic edible seaweeds. Tryckt på Munken Pure Rough 150 gram. Pappret har en bestruken och robust men ändå mjuk yta i kombination med en cremevit nyans som framhäver bildernas egenskaper. Affischens uttryck liknar en gammal skolaffisch. Illustrationer: Maj Persson. Grafisk form: Rebecca Wessberg. Storlek 70x100 cm. 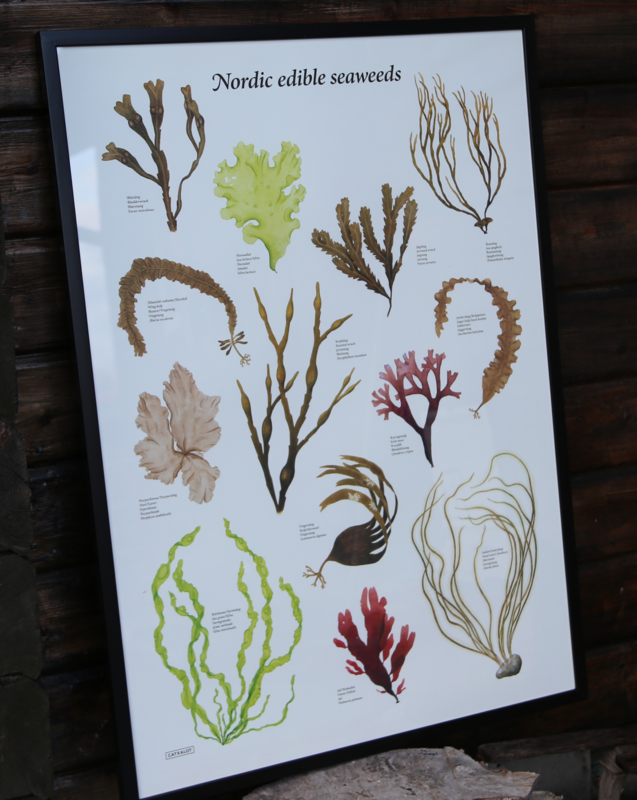 Poster with illustrations of 13 edible seaweed species in the Nordic region with Swedish, Norwegian, Danish, English and Latin names. Nordic edible seaweeds. Printed on Munken Pure Rough 150 grams. The paper has a coated and sturdy yet soft surface in combination with a creamy shade that emphasizes the properties of the pictures. The expression resembles an old school poster.